Testing and Checking Refined | Satisfice, Inc. This post is co-authored with Michael Bolton. We have spent hours arguing about nearly every sentence. We also thank Iain McCowatt for his rapid review and comments. This evolution can be an insidious process that challenges how we label ourselves and things around us. We may witness how industrialization changes cabinet craftsmen into cabinet factories, and that may tempt us to speak of the changing role of the cabinet maker, but the cabinet factory worker is certainly not a mutated cabinet craftsman. The cabinet craftsmen are still out there– fewer of them, true– nowhere near a factory, turning out expensive and well-made cabinets. The skilled cabineteer (I’m almost motivated enough to Google whether there is a special word for cabinet expert) is still in demand, to solve problems IKEA can’t solve. This situation exists in the fields of science and medicine, too. It exists everywhere: what are the implications of the evolution of tools on skilled human work? Anyone who seeks excellence in his craft must struggle with the appropriate role of tools. Therefore, let’s not be surprised that testing, today, is a process that involves tools in many ways, and that this challenges the idea of a tester. This has always been a problem– I’ve been working with and arguing over this since 1987, and the literature of it goes back at least to 1961– but something new has happened: large-scale mobile and distributed computing. Yes, this is new. I see this is the greatest challenge to testing as we know it since the advent of micro-computers. Why exactly is it a challenge? Because in addition to the complexity of products and platforms which has been growing steadily for decades, there now exists a vast marketplace for software products that are expected to be distributed and updated instantly. We want to test a product very quickly. How do we do that? It’s tempting to say “Let’s make tools do it!” This puts enormous pressure on skilled software testers and those who craft tools for testers to use. Meanwhile, people who aren’t skilled software testers have visions of the industrialization of testing similar to those early cabinet factories. Yes, there have always been these pressures, to some degree. Now the drumbeat for “continuous deployment” has opened another front in that war. We believe that skilled cognitive work is not factory work. That’s why it’s more important than ever to understand what testing is and how tools can support it. For this reason, in the Rapid Software Testing methodology, we distinguish between aspects of the testing process that machines can do versus those that only skilled humans can do. We have done this linguistically by adapting the ordinary English word “checking” to refer to what tools can do. This is exactly parallel with the long established convention of distinguishing between “programming” and “compiling.” Programming is what human programmers do. Compiling is what a particular tool does for the programmer, even though what a compiler does might appear to be, technically, exactly what programmers do. Come to think of it, no one speaks of automated programming or manual programming. There is programming, and there is lots of other stuff done by tools. Once a tool is created to do that stuff, it is never called programming again. Now that Michael and I have had over three years experience working with this distinction, we have sharpened our language even further, with updated definitions and a new distinction between human checking and machine checking. Checking is the process of making evaluations by applying algorithmic decision rules to specific observations of a product. “evaluating” means making a value judgment; is it good? is it bad? pass? fail? how good? how bad? Anything like that. “evaluations” as a noun refers to the product of the evaluation, which in the context of checking is going to be an artifact of some kind; a string of bits. “learning” is the process of developing one’s mind. Only humans can learn in the fullest sense of the term as we are using it here, because we are referring to tacit as well as explicit knowledge. “exploration” implies that testing is inherently exploratory. All testing is exploratory to some degree, but may also be structured by scripted elements. “experimentation” implies interaction with a subject and observation of it as it is operating, but we are also referring to “thought experiments” that involve purely hypothetical interaction. By referring to experimentation, we are not denying or rejecting other kinds of learning; we are merely trying to express that experimentation is a practice that characterizes testing. It also implies that testing is congruent with science. the list of words in the testing definition are not exhaustive of everything that might be involved in testing, but represent the mental processes we think are most vital and characteristic. “algorithmic” means that it can be expressed explicitly in a way that a tool could perform. “observations” is intended to encompass the entire process of observing, and not just the outcome. “specific observations” means that the observation process results in a string of bits (otherwise, the algorithmic decision rules could not operate on them). Testing encompasses checking (if checking exists at all), whereas checking cannot encompass testing. Testing can exist without checking. A test can exist without a check. But checking is a very popular and important part of ordinary testing, even very informal testing. Checking is a process that can, in principle be performed by a tool instead of a human, whereas testing can only be supported by tools. Nevertheless, tools can be used for much more than checking. We are not saying that a check MUST be automated. But the defining feature of a check is that it can be COMPLETELY automated, whereas testing is intrinsically a human activity. Testing is an open-ended investigation– think “Sherlock Holmes”– whereas checking is short for “fact checking” and focuses on specific facts and rules related to those facts. Checking is not the same as confirming. Checks are often used in a confirmatory way (most typically during regression testing), but we can also imagine them used for disconfirmation or for speculative exploration (i.e. a set of automatically generated checks that randomly stomp through a vast space, looking for anything different). One common problem in our industry is that checking is confused with testing. Our purpose here is to reduce that confusion. A check is describable; a test might not be (that’s because, unlike a check, a test involves tacit knowledge). An assertion, in the Computer Science sense, is a kind of check. But not all checks are assertions, and even in the case of assertions, there may be code before the assertion which is part of the check, but not part of the assertion. These definitions are not moral judgments. We’re not saying that checking is an inherently bad thing to do. On the contrary, checking may be very important to do. We are asserting that for checking to be considered good, it must happen in the context of a competent testing process. Checking is a tactic of testing. If you follow our work, you know that we have made a big deal about sapience. A sapient process is one that requires an appropriately skilled human to perform. However, in several years of practicing with that label, we have found that it is nearly impossible to avoid giving the impression that a non-sapient process (i.e. one that does not require a human but could involve a very talented and skilled human nonetheless) is a stupid process for stupid people. That’s because the word sapience sounds like intelligence. Some of our colleagues have taken strong exception to our discussion of non-sapient processes based on that misunderstanding. We therefore feel it’s time to offer this particular term of art its gold watch and wish it well in its retirement. Although sapience is problematic as a label, we still need to distinguish between what humans can do and what tools can do. Hence, in addition to the basic distinction between checking and testing, we also distinguish between human checking and machine checking. This may seem a bit confusing at first, because checking is, by definition, something that can be done by machines. You could be forgiven for thinking that human checking is just the same as machine checking. But it isn’t. It can’t be. In human checking, humans are attempting to follow an explicit algorithmic process. In the case of tools, however, the tools aren’t just following that process, they embody it. Humans cannot embody such an algorithm. Here’s a thought experiment to prove it: tell any human to follow a set of instructions. Get him to agree. Now watch what happens if you make it impossible for him ever to complete the instructions. He will not just sit there until he dies of thirst or exposure. He will stop himself and change or exit the process. And that’s when you know for sure that this human– all along– was embodying more than just the process he agreed to follow and tried to follow. There’s no getting around this if we are talking about people with ordinary, or even minimal cognitive capability. Whatever procedure humans appear to be following, they are always doing something else, too. Humans are constantly interpreting and adjusting their actions in ways that tools cannot. This is inevitable. Humans can perform motivated actions; tools can only exhibit programmed behaviour (see Harry Collins and Martin Kusch’s brilliant book The Shape of Actions, for a full explanation of why this is so). The bottom line is: you can define a check easily enough, but a human will perform at least a little more during that check– and also less in some ways– than a tool programmed to execute the same algorithm. Please understand, a robust role for tools in testing must be embraced. As we work toward a future of skilled, powerful, and efficient testing, this requires a careful attention to both the human side and the mechanical side of the testing equation. Tools can help us in many ways far beyond the automation of checks. But in this, they necessarily play a supporting role to skilled humans; and the unskilled use of tools may have terrible consequences. You might also wonder why we don’t just call human checking “testing.” Well, we do. Bear in mind that all this is happening within the sphere of testing. Human checking is part of testing. However, we think when a human is explicitly trying to restrict his thinking to the confines of a check– even though he will fail to do that completely– it’s now a specific and restricted tactic of testing and not the whole activity of testing. It deserves a label of its own within testing. Human checking is an attempted checking process wherein humans collect the observations and apply the rules without the mediation of tools. Machine checking is a checking process wherein tools collect the observations and apply the rules without the mediation of humans. Human/machine checking is an attempted checking process wherein both humans and tools interact to collect the observations and apply the rules. In order to explain this thoroughly, we will need to talk about specific examples. Look for those in an upcoming post. Meanwhile, we invite you to comment on this. UPDATE APRIL 10th: As a result of intense discussions at the SWET5 peer conference, I have updated the diagram of checking and testing. Notice that testing is now sitting outside the box, since it is describing the whole thing, a description of testing is inside of it. Human checking is characterized by a cloud, because its boundary with non-checking aspects of testing is not always clearly discernible. Machine checking is characterized by a precise dashed line, because although its boundary is clear, it is an optional activity. Technically, human checking is also optional, but it would be a strange test process indeed that didn’t include at least some human checking. I thank the attendees of SWET5 for helping me with this: Rikard Edgren, Martin Jansson, Henrik Andersson, Michael Albrecht, Simon Morley, and Micke Ulander. This entry was posted in Important!, Language, Testing vs. Checking by James Bach. Bookmark the permalink. James, I’ve read the above description a few times, but I fail to comprehend a particular part of this description. Maybe its ignorance on my part, but can you explain why or how testing includes only “to some degree:” questioning, study, modelling, observation and inference? Are you implying that there maybe (or are) more ways to evaluating a product through experimentation other than questioning, study, modeling etc.? Or are you saying that testing comprises of experimentation through part questioning, part study, part modelling, part observation and part inference? (An analogy of my question is how a dish (test) is prepared… 2 cups of water (questioning), 2 teaspoons of salt (study) etc.). In addition to what James has to say above, have a look at Exploratory Skills and Dynamics (http://www.developsense.com/resources/et-dynamics3.pdf); and try a search on his site and mine for “what testers find”. You’ll see lots of others things (and many more on our sites) that could be included under “learning about the product through experimentation”. Thanks Michael, I’ve been doing exactly that after I read James’ response. Your blogs opened my mind to many things I didn’t see before (but wanted to). I believe in human’s high cognitive capacity. This is something a person can build inside the brain. There’s a very interesting book on that called “The Talent Code” by Dan Coyle. Great Article, very thought provoking. The comparison between machine checking and human checking i thought was really good. Thank you. See my comments below. NB: Apologies in advance if some of my comments have already been made as i haven’t read through all the comments made by others. RF: Do you mean testing quickly in terms of running more tests in a shorter period? Testing a product quickly is what those think about cost first would say. [James’ Reply: “Running more tests in a shorter period” doesn’t really mean anything, because there is no general meaning to the numbering of tests. I mean we need to find those important bugs as soon as reasonable. We need to work with urgency. RF: I think this is a brilliant distinction to make. A warrior learns his craft and can apply it using any tool. A spear thrower learns his tool and attempts to apply it to any situation, limiting his craft to one tool. As testers we shouldn’t be letting our tools shape us but rather we should learn our craft. People seem to be learning the tools and calling themselves craftsmen which is the problem, this might be driven by the assumption or fact that products are becoming too complex for the craft. “Testing is the process of evaluating a product by learning about it through experimentation, which includes to some degree: questioning, study, modeling, observation and inference. RF: I am assuming the distinction is purely down to Testing being continuous experimentation where as checking is referring to stopping after evaluating an observations ie expected result? I think a check is an instance of testing but we should identify in testing when it’s a check or a test. I think this will encounter the push back it seems exploratory testing seems to constantly have. In organisations they seem more keen on checks than tests, and it seems a lot of testers instead of pushing to add more value are satisfied with just doing what customers want and ignoring tests. Checks come across as confidence builders, which do not focus on finding the important bugs. Testing ends up being just a confidence activity which is just a fraction of what testing is. [James’ Reply: I don’t think it’s fair to say that organizations prefer checking to testing, because such organizations don’t know what they are doing. They don’t know enough to have a preference. I agree with the concept but my only disagreement is that Checks are instances of testing as they are being done to evaluate a product by learning about it through observations. Even if you only learn about an observation/expected outcome. [James’ Reply: You don’t actually disagree. What you are doing here is not understanding. If you don’t understand something, whether or not you agree is irrelevant. A question I raised to Michael regarding checking vs testing comment on twitter: Is executing theories in the form of test ideas/cases, checking or testing? My initial answer: This is based on my thinking that we experiment with theories, ask questions, observe etc during the test design process hence test ideas that get generated are still tests. My new answer: Based on the above definition, if no further test ideas are generated after evaluating the theory then it’s a check, but if the theory is evaluated and based on the learning/outcome further test ideas are generated then it’s a test as long as the cycle of learning continues. Hence test ideas are still checks when we don’t go past the initial observation identified during evaluation of the test idea. RF: Should this be Human learning as by the definition of learning, Machines are also capable. RF: During experimentation we observe the products behavior to interactions, its environment etc…it’s not just the product we are observing. RF: I agree, my initial thoughts being humans find it difficult to follow/stick to rules whereas machines thrive on applying rules, processes etc. Machines can perform a streamlined version of human activities, with boundaries/constraints intentionally/unintentionally set. What Machines can do human activities stripped into logic and programmed by a human to be executed by a machine. My only disagreement is that Machine checking is an outcome/output of Human checking, hence should be within Human checking? I checked, there is no special word for cabinet maker. Following up a discussion on Twitter: how does the ideas of test vs checking relate to the concept of scripted testing vs exploratory testing? I feel that there are similarities between the concepts. If we for instance imagine “pure” scripted testing, will that only contain checks and no testing? Scripted testing means testing that in some *aspect* is scripted. Scripted means controlled from the outside of the conscious test execution process, rather than being completely controlled consciously by the tester. There are many ways in which bits and pieces of testing might be scripted. If *everything* is scripted, however, I would not call that testing. Testing is a thoughtful process of investigation and consideration. We can’t script that. What I once called “pure scripted testing” I would now call checking. Although it’s part of testing, I don’t think we should call it testing (the same way we don’t call a leaf a “tree”). My language has evolved. So, checking CAN be scripted but it isn’t necessarily so. All machine checking is scripted. All human checking is an attempt by a human to emulate machine checking, so it is often scripted, too. Checking is not necessarily scripted, however, because checking may be pursued in the moment, under the control of the tester. What makes checking “checking” is not that it is scripted in some way or another, but rather that it is *completely* scriptable. I’m wondering if the intention of the users actions (or process) is important when determining whether we are testing or just checking? Clearly tools do not have any intent, they just follow a script. People may also follow a script without thought or intent. But, a good tester with a desire to learn will be testing even when following a script. A tester may also utilise a tool to carry out checks on their behalf, the tool maybe just checking but the tester will be experimenting or exploring through the tool. We could attempt to make discoveries through experimentation but not actually learn anything that helps us to evaluate a product. Is this not to be considered testing because we failed to learn anything to help in an evaluation? – I’d say it is still testing. In contrast we may observe an anomaly in the results of an automated suite that gives us salient information even if we had no intention of learning. [James’ Reply: How could that be? If you were running an automated set of checks, then you had intent to do so, right? That intent is probably to test the product. Or are you saying that someone delivering a pizza who happened to glance at a screen might “notice an anomaly that gives us salient information?” If so, then such a person would probably ignore it, but in any case I would not call that testing. During the run there was just a machine performing checks, when it finishes and we examine the output does this retrospectively becoming testing because can make a value based judgement based on our observation? Seems to me the checks are still just checks, the testing doesn’t begin until after human interaction. [James’ Reply: It’s not that it retroactively becomes testing (although there might be such a thing in the case of a delayed oracle, whereby you see a specification today, and suddenly realize that a behavior you saw a week ago was actually a bug, thus rendering what had been a tour of the product into what retroactively becomes a test), it’s the the checking process is embedded ALL ALONG in a testing process. You can’t design the checks without engaging in testing (possible poor testing), you can’t decide to use the checks with engaging in testing, and you can’t interpret the results of the checks without engaging in testing. Or, is there perhaps a grey area between where checking stops and testing begins? I was recently working on a large and complicated but poorly documented application undergoing transformation to a new platform. Knowing that testing resources were stretched and being charged with creating an automated regression suite we had to be creative in our activities. We used SQL queries to introduce some variability into the data for our automated scripts. This would allow us to perform the necessary regression checks whilst leaving open the opportunity to discover things about the product. c) the script executed a scenario that had not been tested before (or possibly even documented) and the code had not been developed according to the business need, though not technically a regression error (again we learnt something). Although the primary objective of this activity was regression checking, we were also learning about the system when the checks failed. I’m not sure I’d call this experimentation although there was the intention of learning through observation, so I’m not sure if it meets your definition “testing” or not. Maybe this an example of what you’d call “speculative exploration”, though I wouldn’t call the inputs exactly random. [James’ Reply: By any scientific notion of “experiment” I know, you are running an experiment. You are testing. Your primary objective is testing. You are wishing to know the status of the product. It is motivated by this research question “what is the status of my product after these changes?” You are using a machine-checking process to fulfill most of the fact gathering and initial evaluation of the results. Now, it may be poor testing, I don’t know. That depends on the quality of your design and management of the test-that-includes-the-checks. When the tests failed we learnt something, but if the tests all passed we didn’t (at least for that run). We could’ve built the tests with hard coded data just to check for regression issues – I’d call this checking. However, we built the tests with the intention to learn, expecting to find issues and knowing that we would have to investigate and evaluate. We may have only been utilising automated checks (most of the time) but I’d still call this testing. I read through some older posts from Michael Bolton and you regarding the topic ‘testing and checking’. But there is a point in this post that makes think. “evaluating means making a value judgment”. Is it really a testing task making a value judgement of a product? I have a rule mind that says “Never be the gate keeper.” How should it be done to say a product is good or bad for testers? In addition making a value judgement and open-ended investigating a product seem to be counterparts. Didn’t you say testing provides information for someone who has the authority to make a informed decision or a value judgement about a product? Are testers mutated to stakeholders? [James’ Reply: This is a great question, Florian. The value judgments we make as testers are not personal judgments, but rather judging with respect to the values of our stakeholders. When I see a bug, I am always asking myself whether my clients would consider that a threat to the value of the product, whether or not I personally might think so. The judging that stakeholders do can be yoked directly to decisions about the product, whereas the judgments testers make relate only to the direction of their work and what (and how) they report. I experiment a little bit with a tablet exposed in a store just for fun after work. I won’t evaluate it for buying. I act only just for fun, but I am learning something about this product. Is this testing? You wrote a reply on one comment here that says “You can’t do testing … without the intent to test”. I repeat your definition of testing here, too: “Testing is the process of evaluating a product by learning about it….”. I act consciously and in an act of volition in my thought experiment above, but I only want to play and learn(!) a little bit with the tablet. Is it testing? Sure, there is no obvious intent for testing, but how can I differentiate between an intent for testing and other intents? That leads to my starting question “What is the essence of testing?” in your understanding? In developing the MetaAutomation pattern language, I’ve been keeping in mind the vast difference in design and artifact between a manual test (executed by a human) and an “automated test” (executed by a test harness etc.) and how much I’ve struggled with widespread ignorance that there’s any difference there at all. I’ve even written a bunch about it for my book, but my treatment of that topic didn’t quite feel right. You’ve solved the problem for me: there is no such thing as an “automated test,” or at least not a fully “automated test.” These are called “checks.” If somebody talks about running automated tests, it’s just because they haven’t gotten the news yet. Thanks to Michael Bolton for referring me to this blog post, and thanks in advance to James Bach for his feedback especially because I know he won’t pull his punches. A good explanation of your concept. The distinction is useful. Unfortunately, it doesn’t align with how the words are used out there in the real world. You might encounter a lot less resistance if you came up a new word for what you refer to as “Testing but not Machine Checking”. Maybe stick with “Exploring”. BTW, if my memory of how Venn Diagrams serves me well, your diagram contradicts your words. Well, actually, I’m not even sure how to interpret the diagram since Testing is outside the oval. Is it just an oval that is so big that we cannot see any part of it? If so, everything inside the large oval is part-of or a kind-of Testing. [James’ Reply: Okay, since you want to be precise let’s use words properly: it’s an ellipse, not an oval. I’m sure you already know the difference, but it’s fun and useful for me to point out that you, yourself, in criticizing my perceived inexactitude, have also found that in human communication, words are heuristics. How precisely we use them varies with the situation. I like to be quite precise, but I am rarely as precise in natural language/communication as I am when I write code. You sensed that you could say “oval” without sounding like a buffoon or confusing me– and you were right. In this case, my intent is to be very precise. So, I’m taking your criticism seriously. And Machine Checking is a kind of “Learning by experimenting. …” Which doesn’t sound right. 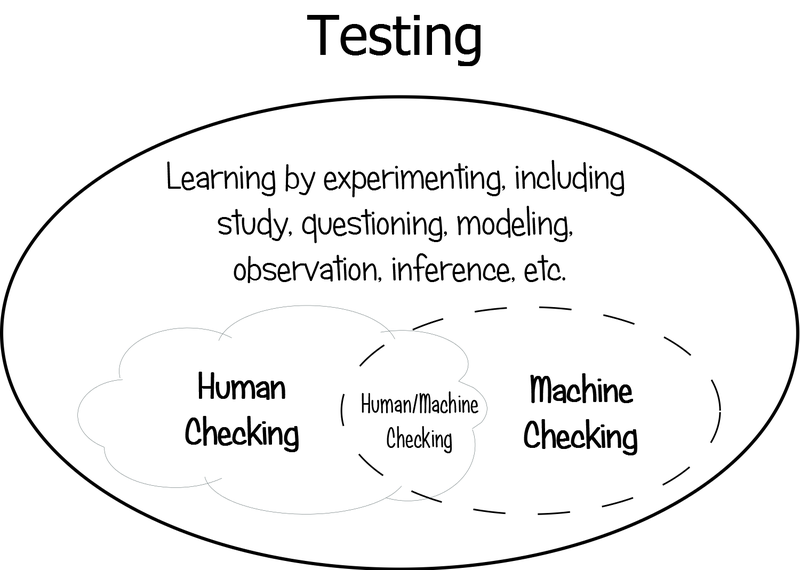 So maybe “Learning by experimenting” needs its own oval which doesn’t intersect with Machine Checking and maybe overlaps Human Checking a little bit. And Testing should be inside the large oval to indicate that all these kinds of checking and experimenting are different kinds of testing. But wait, aren’t you saying that Machine Checking is not Testing? Ack! That implies the oval for Testing should intersect Human Checking but not Machine Checking. I’m having a hard time coming to a conclusion on the following thought I had, could you please offer your insight – thanks in advance. How do you decide which checks are worth automating and which checks are best left to be done manually? Automation seems like an obsession now and it feels to me that the pervading feeling is that if it can be automated, then automate it. That doesn’t sit right with me, since there’s an overhead in creating and maintaining the check. [James’ Reply: The answer to that relies on many specific factors such as: what tools I have, what skills I have with tools, what product risk is associated with the check, what else I have to do, how much the situation is changing, how complex the oracle is, how testable the product is, what my team wants me to do, what I want to do, etc. Though a bit late to comment… it is a wonderful problem you are dealing with in your article!